Alstom has delivered the first light rail vehicle for Phase 2 of the Kaohsiung tram in Taiwan. 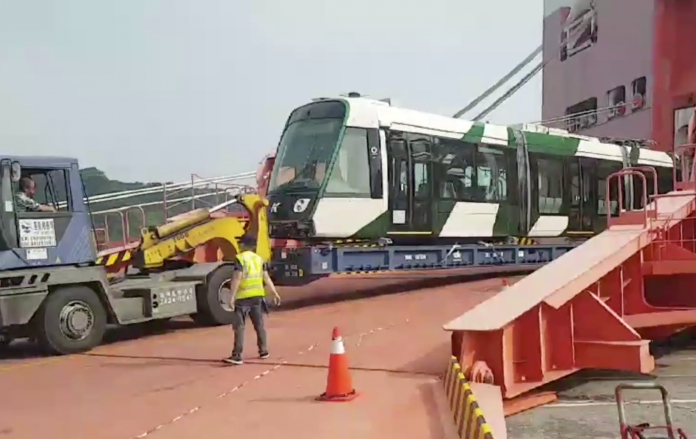 The tram, which was manufactured in La Rochelle, France, arrived at the port of Keelung on 2 September and was then delivered to Kaohsiung. It will go through coupling, visual inspection and preliminary works in the coming weeks before it is put on track for tests at the end of September. In January 2017, Alstom won a contract from China Steel to supply 15 Citadis trams for Phase 2 of the Kaohsiung tram. All trams will operate using an on-board energy storage solution, which are recharged in 20 seconds when vehicles stop at stations, meaning the line is catenary free. A section of Phase 2 of the Kaohsiung Tram is expected to start revenue service in 2019.